It was at one of the picnics that the concept of creating small industries to benefit local farmers during winter months and economic downturns was discussed. 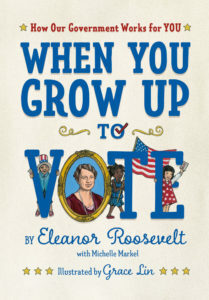 “When You Grow Up to Vote” (Roaring Brook Press), written by Eleanor Roosevelt and reissued with writer Michelle Markel and illustrator Grace Lin. In 1932, Eleanor Roosevelt’s husband Franklin had just been elected president. In the throes of raising five children, Eleanor thought they should know “what their parents were up to” and “how it all worked,” according to her granddaughter Nancy Ireland. “When You Grow Up to Vote: How Our Government Works for You,” a civics book Eleanor wrote for young children that year, only came across Ireland’s desk a year ago, even though she has spent three decades in charge of her grandmother’s literary estate. “I was never given a copy of it by my parents, which amuses me,” she told PBS NewsHour about the book’s new reissue this month. The book, with revised text by Michelle Markel and illustrations by Grace Lin, explains to readers age 6-12 (and beyond) that we all have a stake in how our democracy is governed. We will ban its judges and prosecutors from entering the United States. We will sanction their funds in the U.S. financial system, and we will prosecute them in the U.S. criminal system. We will do the same for any company or state that assists an ICC investigation of Americans.